Being the capital of Ireland, Dublin is one of the top 25 cities of the world, with a growing population and a history that dates back to the Norman invasion. 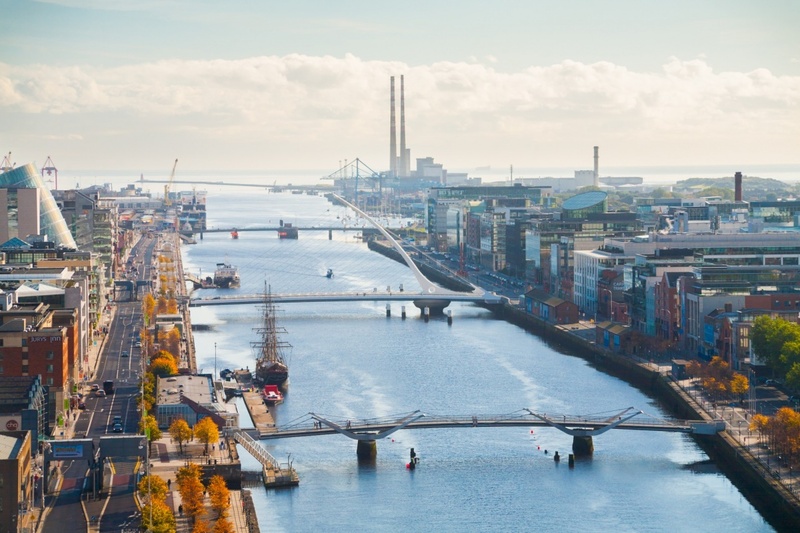 Dublin stands for the Irish word Dubh Linn which means black pool, and it is located near the midpoint of Ireland’s east cost at the centre of the Dublin region and near the Liffey River. It is very difficult to pinpoint the exact date when this city was actually established as the history of Dublin goes back a long way into ancient history, however, it is important to note that in the 17th century Dublin was considered to be one of the biggest cities of the British empire and also was considered to be the fifth largest European city as well. The city saw a lot of architectural developments in the 1700s, although it had to face two major plagues at that time as well. However, in the 1800 and 1900s, the city did not see too much of developments in any business of economic growth and therefore, that it is perhaps why it is called the last 19th Century City of Europe. However, since the formation of a new state, Dublin has changed a lot and you can see these changes affecting the way how people are looking at this city which is rich in cultural heritage. The creation and establishment of the Guinness brewery gave the city a chance to survive the tough times. Being a company established in the 1800’s, this is considered to be one of the world’s oldest breweries to have survived the passage of time through very difficult times of wars and shifts in the economic and political era of the Irish people. However, it is amazing to see that it is now considered to be the biggest company supplying beer to the whole world. Located in the centre of Dublin, this is perhaps a place that you need to visit to be able to appreciate from every perspective. The combination of the old and the new are so uniquely interloped that you will have trouble seeing the difference. The Trinity College was established by a small group of people in the 1600’s, this is a college that has seen a lot in its time. With a mission to become one of the world largest and best colleges that is giving their students and the community the necessary education they need to create a steady and firm future for themselves, the college has been able to make its mark and it is now considered to be one of the best colleges in the world. The college has been able to maintain the cultural and artistic traditions well known in Ireland and it is very famous for Baroque music as well. This is a massive structure which was build in the 1200s and which represents the strength of the Irish empire at that time and what it has seen throughout the centuries that has been able to handle. This Castle was once the seat of political power and it now stands to tell its story. It is still used for special functions, like the inauguration of the Ireland’s President and you can always think of visiting this place and be amazed at what you can discover of the oldest surviving building in Dublin. The Christ Church Cathedral located in the central area of Dublin city is another historical monument from the past thousand years of history of this enchanting city. It is no wander that they are thousands that have come and passed through the gates of this church dedicated to the faith of every individual. People from all walks of life are welcomed and they are attracted to the richness of its architecture, combined with the purpose that this special monument has served through very different times. The Cathedral’s choir was founded in 1480 and it is being a part of the musical life of Dublin for 500 years now. You can also have a guided tour of the Kilmainham Jail, where many Irish heroes spend a lot of their time. This Jail was built in 1795 and it was closed in 1924. However, the building still stands to tell the story of what the Irish people have encountered in their very difficult journey in life in the past. It is however very important to see that this is definitely the past as Dublin is a city that is seeing a rapid change in the way how it is presenting itself to the rest of the world from every point of view. You cannot miss to take a trip to the temple Bar. This is an establishment that has got a very special collection of wines from all over the country and which is rich in music and entertainment. You will feel very welcomed at the Temple Bar and you will have the time of your life choosing the right collections and the freshly baked breads and mouth watering fillings as well. When it is time to enjoy Dublin city, this is a place you must visit. Like any other big city in the world, you will find that shopping in Dublin is a very rewarding experience. Most of the shopping malls and fashionable stores are located in the centre of the city and you can find anything and everything from cloths, to jewelers, to books to second hand cloths and fortune telling as well. On the south side of the city you will also find outdoor food markets and gift shops as well. The shopping centers are definitely very modern and you will be able to find any brand name that you may look for in these stores. Find information about selected Hotels, apartments and rooms in Dublin to choose the perfect place for your accommodation.